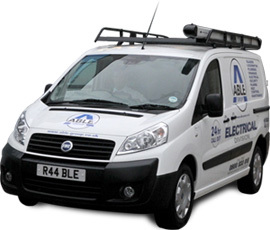 Able Electric excel in electrical lighting so when you’re in need of electrical lighting repair or installation you can trust one of our electrical experts to provide a professional service with minimal fuss. Whether it be light switch replacement or re-wiring our local electricians can be with you woithin 30-90 minutes. We can also install or repair emergency lighting systems that meet fire and safety regulations for commercial properties. For any questions you may have or for a free quote on any electrical lighting work we provide a free phone service with trained 24/7 operational staff on hand to help.